Procedure of excellence, hard work and pure energy has always been my credo. 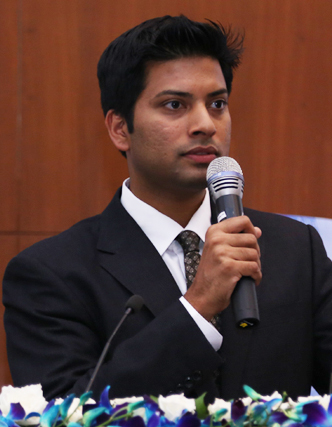 My name is Mittu Chandilya, I am the CEO of AirAsia in India. I have the privilege and honor of being the first employee in AirAsia India about a year and half ago and in many ways this company is my fourth baby. I have three sons at home and this is my fourth one and it has now given birth to about 450 employees. What I said at the start I think applies as much to entrepreneurs as it does to athletes. Hard work, procedure of excellence and just hunger to learn and improve myself, are what get me through most of my days, and also are what get me through most of my nights. I can’t stress enough on that. I think along with this belief you need a tremendous amount of energy. And just like with athletes, when your energy tank hits zero you somehow find a booster tank to get you going. I have always thought about ISB and how it is making India proud. So when I was contacted, I accepted immediately. The driving force in life has always been to do something that nobody else wants to do, dream the impossible, always aim and make sure that you are aiming for something much bigger than yourself. Never chase money, money will find its way to you and just do something phenomenal. My life has been a contradiction right from Day 1. My grandfather was a freedom fighter. My father grew up in a family, which was of very humble background. He did not have enough money to even go to school. They were five siblings and the only way he could go to school was when he got scholarships. Actually my father and his elder brother had to share one uniform. His elder brother would go to school in the morning and my father would go in the evening wearing that same uniform. My father went down the difficult track of becoming an engineer, the whole IIT, IIM thing. Then he got his MBA and started his own business. My mother, on the other hand, was entirely different. She was an ex-model and then went on to join the hospitality industry and later she became a well-known artiste. So dinner table conversations were always fun because we had a balanced yet variety of topics to discuss. I had an interesting childhood because I have been living alone since I was nine years old. My parents moved to Africa and education there was just not the best. So they left me here to study at Rishi Valley School. I was there until I was about 15. Then I came back and lived one year in Chennai and then I decided to go to the U.S. I always had a dream of going to the U.S. not because the schools in India were not good enough because I had just found out that the U.S. was the world leader, so I thought if I could be the best there, I could bring some of that back to India one day. I was always a driven kid, though I wasn’t academically strong, may be I should not say that to you. I used to score 90 percent but I wasn’t a topper in the class. I was one of the kids, the others hated because I would never study before an exam, I just would not study. I would sit in class and ask these weird questions and just remember things and then would take the exams. It is not that I did not want to work hard. I just felt like I did not want to sit there reading a book when I could actually try things practically. I grew up in a family where my parents always believed that you have got to try everything, don’t say no to anything – try everything. I remember when I was six years old, I was taking ballet lessons. It was embarrassing since I was the only guy there wearing pink leotards and prancing around. I told my mom that I am not doing ballet. She asked me why? I said that because I am the only guy there. She said that I had to try at least for an year befor I quit. That is how life has always been; try defferent things that nobody else would try and see if your cand do those better than them before taking a decision. I became a tennis player and because of that I got a scholarship to study in a university in the U.S. I took on odd jobs. One of them was being a fashion model in New York and did that for a while. I got an opportunity to act which was something entirely different, since this meant I had to do a TV show, which I declined coming from the roots that I did. The TV show has now become very big and it is called CSI. I ended up starting my own company when I was 19. As a youngster, starting I went to national levels and ended up selling that really quickly. Then went to join a company called Ingersoll Rand. I chose Ingersoll Rand because again it is so different from who I am. It is an engineering and a manufacturing company. I was a finance major, I was a marketing guy, I was a supply chain guy. I did not care about engineering, I did not care about manufacturing at all. I said let me go and look, I have a lot to learn. If I go and I become successful there and learn everything that I can, I can probably do something that I like equally well. So I did that, I did that for about nine years. I first started off with mergers and acquisitions and then started taking care of their North American operations. I was the youngest general manager they had. At 23 years, I moved to China, ran Asia-Pacific and ultimately down to Malaysia and Singapore. I have made some crazy decisions career-wise. But my driving force in life has always been to do something that nobody else wants to do, dream the impossible, always aim and make sure that you are aiming for something much bigger than yourself. Never chase money, money will find its way to you and just do something phenomenal. I don’t see ourselves as an aviation company. I am competing with marketing, branding and digital companies. When AirAsia reached out to me, we had some good discussions. There were some general discussions as well. They had heard me speak at some conference and asked me why don’t you come and join us. Then I had this chance of talking to the Tatas, Ratan Tata as well as with his entire team and Cyrus too. It just felt so attractive. And I thought, this could be an industry where you can come, shake the industry, create a legacy. So, I just told them one thing and it was that I don’t want to be measured by how big the airlines is because I will make it a big airlines and I will make it successful. But I want to be measured by how dramatically we change this industry. It doesn’t matter if my planes run beautifully, run on time and customer service is good and still the passengers have to wait for long for their baggage. Then flyers, passengers, customers will have every reason to complain about the bad service. So, I said how can I restructure with the entire aviation industry from policies to airport infrastructure to make sure that India is on par with the rest of the world when it comes to aviation. AirAsia as a group is a phenomenal group and I think it matches really well with my personality. And being employee No. 1. I was able to infuse a lot of who I am into the company. We have hired about 70 percent of our work force from candidates who don’t have an aviation background. So I made a conscious decision to go with hiring on potential as opposed to experience. The No. 1 thing that will probably put me off is if somebody comes to me and says this is not doable because it has never been done in aviation. I don’t see ourselves as an aviation company. I am competing with marketing companies, branding companies and digital companies. We make decisions fast, we take risks and we build a profitable business. We did that and the team is jetting well. We have grown to about close to 500 now and we are continuing to expand. It has been a rollercoaster ride but one with a lot of learning and one that we continue to keep growing with. Convincing people who are older to me has never been an issue. I don’t see age as being the issue at all. Though you have got to prepare very, very well given your age. I believed, above all it is the vision for the company that matters. You need confidence to make the decisions and you must be able to live by them. That is why, I say if anybody aspires to be a CEO, think twice about it because it is not as glamorous as you think. Every day the decisions that you make impact several others in the company or outside. The title and job never give you that authority beyond a point. What really gets you there is that people really love you, they are loyal to you and even if they disagree with you they understand why you did, what you did. And after that age does not matter. If anybody aspires to be a CEO, think twice about it. It is not as glamorous as you think, it is because every day the decisions that you make impact several others in the company. The aviation industry has been on a bumpy road since 2003. We have had mergers, we have had acquisitions, we have had a lot of divestures and unfortunately we have had some bankruptcies. And it is a result of many external factors but it is because of many internal factors as well. How do you run your company? We have to think about how costs can be kept low without compromising on safety, quality or customer experience. This means we have to monitor costs very closely. There are temptations to charge more. But don’t give in. Hold it constant. In the same way, don’t expand if you are a one-service carrier. Don’t get over-ambitious to open a business-class, first class and all that. I think the industry is evolving. It has to do a lot with external factors but internally on how your model is set up, what your philosophy is – will decide a lot for the success of your company. Unfortunately, in India airlines are very much in a win-lose kind of situation. It is a very archaic kind of industry where people seem to think that the only way they can win is, if they have major share holdings. So many, in order to compete, will often offer cheaper tickets. And thus have greater market share. I don’t even look at market share. It is not important to me. What is important is the service, the fares, how many people I am moving. As to the question what are the attributes that make a great CEO, I think it is very hard to generalise. I think every CEO needs to have his own characteristics, his own style. And he needs to complement the industry and the size of business and the state of the business that he is in. I think every person who aspires to be a CEO or is a CEO, should be very self-aware. Know what your strengths are, know what your weaknesses are and know what you are going to do in terms of making up for those weaknesses. I feel that I know myself. As told to ISB students at a recent interaction at the Mohali Campus.